Originally from London, I was, until recently, an English language teacher at Udon Thani Rajabhat University in the northeast of Thailand after spending my first two years in Thailand teaching secondary school pupils at St. John's-Bell Language Center in Bangkok. Having travelled the world and successfully completed a military career, I decided that education in Thailand was an important issue and have devoted my time and effort over the last ten years to creating an educational environment suitable for the local community where I live. Udon Thani is an agricultural area and like many other areas in the Isaan region of Thailand, seems to be neglected, especially when it comes to education. Designing curriculum, syllabuses and courses, as well as presenting academic papers and teaching, I am of the opinion that one person can make a difference and that no task, however large or difficult is impossible to complete if you put your mind to it. Unfortunately, the powers that be at Udon Thani Rajabhat University have decided that education at their university would be better off without my intervention; so with the majority of the foreigners working at the Language Center, I find that my services are no longer required. All was not lost, as the good people at Khon Kaen University International College deemed fit to employ me as a lecturer at their internationally recognised institution. It may not surprise you to learn that the good people at Khon Kaen University International College were not as good as I thought and it took only three and a half years before I was asked to leave the not so internationally recognised Khon Kaen University International College and stake a claim at Rajamangala University of Technology Isan (RMUTI), Khon Kaen Campus. Sources close to me are taking bets as to the length of time before my new relocation. For those of you outside Thailand of a betting nature, I was able to stay at Rajamangala University of Technology Isan for two years before deciding that 23,700 baht a month salary was not enough for the work I was doing. Add to that there was not the possibility to work in the MA program and the prospects were bleak on the academic promotion front as I was informed that foreigners were not allowed to be professors. I am now the Director of the English Preparatory Program at the American University of Phnom Penh in Cambodia. At last, a real job with responsibility and a living wage at the end of the month (only just). EdD, MA (TESOL), PGCE (FE), LTCL Dip., TESOL Cert. Dip. RSA, FIAB, LCGI, MCMI, MInstLM. 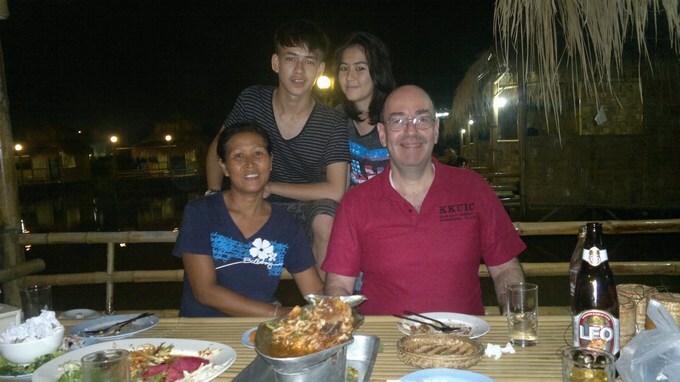 Steve lives with his wife Phangwan and children Sam and Chelsea in Udon Thani, in the north east of Thailand. Both children go to local schools and can speak Thai, English and the local dialect Issan fluently. What follows is a list of presentations and various articles that I have published over the last few years that may be of interest to some people. "English Language Teaching in the Digital Age"
"Responding to Challenges of English Language Teaching for EFL Learners"
National University of Laos, Vientiane Laos PDR. "Advancing Excellence in English Language Teaching through ICT"
"Building a Regional Community: English across Platforms"
"2016 Regional English Language Schools Seminar"
"Promoting Autonomy in Language Teaching and Learning"
"Creating Working Opportunity through English Language Education"
Thailand TESOL Pre-Conference 2016, Mercure Hotel, Chiang Mai, Thailand. The 8th International Conference on Educational Research, Khon Kaen, Thailand. "English: Building Skills for Regional Cooperation and Mobility"
The 11th Annual CamTESOL Conference, Phnom Penh, Cambodia. "Empowering the Regional and International Links through Improving English Language Education"
The 12th Annual LaoTESOL Conference, Vientiane, Lao PDR. External Quality Assurance 2014: What Effect does it have on the EFL Classroom? "Enhancing Indonesian and Thai Educational Systems Compatibility towards ASEAN Community"
The 9th CRISU-CUPT International Conference 2014, Khon Kaen, Thailand. "The 2014 International Conference on Applied Linguistics and Language Education"
"Advancing Techniques and Skills for the Language Teaching Profession"
The 11th Annual LaoTESOL Conference 2014, Vientiane, Lao PDR. "21st Century English Language Education: Towards Global Citizenship"
The 34th Annual Thailand TESOL International Conference, Chiang Mai. Humanities and Social Science for Development"
9th International Conference on Humanities and Social Science, Khon Kaen. "Englishes Across Asian Contexts: Opportunities and Challenges"
The 11th Asia TEFL International Conference 2013. Ateneo de Manila University, Manila, The Philippines. The 6th International Conference on Educational Research, Khon Kaen, Thailand. "Building up of the Research Based Knowledge for Sustainable Development of the Greater Mekong Sub-region." The 1st Nong Khai Campus International Conference 2013, Nong Khai, Thailand. "E-novation and Communities in ELT"
The 33rd Annual Thailand TESOL International Conference, Khon Kaen. "Balancing Globalization and Localization in ELT"
CULI National Seminar, Bangkok, Thailand. "Challenging Education for Future Change"
The 5th International Conference on Educational Research, Khon Kaen, Thailand. 8th Annual CamTESOL Conference on English Language Teaching, Phnom Penh, Cambodia. "Teacher Collaboration: Shaping the Classroom of the Future"
Post ThaiTESOL Conference, Khon Kaen, Thailand. "Teacher Collaboration: Shaping the Classroom of the Future"The 32nd Annual Thailand TESOL International Conference, Bangkok, Thailand. "Innovations for Harmonious Living in a Borderless Society"
The 1st International Student Conference, Khon Kaen, Thailand. 4th International Conference on Educational Research (ICER), Khon Kaen, Thailand. The 7th Annual CamTESOL Conference. National Institute of Education, Phnom Penh, Cambodia. The 31st Annual Thailand TESOL International Conference 2011. The Empress Hotel, Chiang Mai, Thailand. "Pathways in EIL: Explorations and Innovations in Teaching and Research"
Chulalongkorn Language Institute's 7th International Conference, Bangkok. CamTESOL, National Institute of Education, Phnom Penh. The 30th Annual Thailand TESOL International Conference, Bangkok, Thailand. Chulalongkorn Language Institute National Seminar, Bangkok. External Quality Assurance: What Effect Does It Have On The EFL Classroom? "The Assessment Result and its Utilisation in Learning and Teaching" was given at the ONESQA 9th Anniversary Conference held at the Royal Thai Navy Convention Hall in Bangkok. The Graduate Research Conference UDRU, Building One, Udon Thani Rajabhat University, Thailand. The 5th CamTESOL Conference on English Language Teaching, Phnom Penh, Cambodia. The 13th International Conference on English in South East Asia (ESEA) 2008. The 4th PALT International Conference on Language Education (ICLE), Manila, Philippines. The 28th Thailand TESOL International Conference, Khon Kaen, Thailand. 5th International Conference on Science, Mathematics and Technology Education, Udon Thani, Thailand. The 12th English in South-East Asia Conference, Bangkok, Thailand. The 3rd International Conference on Language Education and 47th Annual Convention of the Philippine Association for Language Teaching (PALT), Manila, Philippines. Chulalongkorn University Language Institute National Seminar 2007, Bangkok, Thailand. The 27th International Thailand TESOL Conference and 10th Pan-Asian Consortium International Conference 2007, Bangkok, Thailand. Chulalongkorn University Language Institute’s 6th International Conference, Bangkok, Thailand. "Science, Technology, Education and Local Wisdom for Sustainable Development."